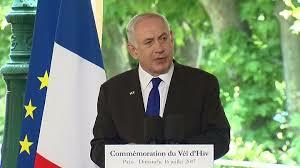 Netanyahu in Paris to commemorate Vel d’Hiv deportation of Jews – Royal Times of Nigeria. Mr Netanyahu also held direct talks for the first time with French President Emmanuel Macron. He is the first Israeli prime minister to attend the Vel d’Hiv commemorations. “I’m here to mourn the victims,” Mr Netanyahu told an audience in Paris, which included Jewish group sand Holocaust survivors. While warning against the dangers of modern extremism, he hailed the “great, great human beings” who had risked their lives to save Jews in France during Nazi occupation. The families were taken to the Velodrome D’Hiver, a cycling stadium near the Eiffel Tower, or an internment camp set up just outside the capital at Drancy.